The cash register with PLU 6000pcs and In built thermal printer. It has 47 Functional keys and 90 Category Department. Cash Drawer consists 3 bill ,5coin (Manual Open through the Knob of the bottom). This comes with 1 year warranty. Optional barcode scanner , electronic scale, kitchen printer, Modem etc. Buy Best Cash Registers Now!! for small and medium businesses…. A cash register, also referred to as a till in the United Kingdom and other Commonwealth countries, is a mechanical or electronic device for registering and calculating transactions at a point of sale. It is usually attached to a drawer for storing cashand other valuables. The cash register is also usually attached to a printer, that can print out receipts for record keeping purposes. An early mechanical cash register was invented by James Ritty and John Birch following the American Civil War. James was the owner of a saloonin Dayton, Ohio, USA, and wanted to stop employees from pilfering his profits. The Ritty Model I was invented in 1879 after seeing a tool that counted the revolutions of the propeller on a steamship. With the help of James’ brother John Ritty, they patented it in 1883. It was called Ritty’s Incorruptible Cashier and it was invented for the purpose to stop cashiers of pilfering and eliminating employee theft or embezzlement. Early mechanical registers were entirely mechanical, without receipts. The employee was required to ring up every transaction on the register, and when the total key was pushed, the drawer opened and a bell would ring, alerting the manager to a sale taking place. Those original machines were nothing but simple adding machines. Since the registration is done with the process of returning change, according to Bill Bryson odd pricing came about because by charging odd amounts like 49 and 99 cents (or 45 and 95 cents when nickels are more used than pennies), the cashier very probably had to open the till for the penny change and thus announce the sale. Shortly after the patent, Ritty became overwhelmed with the responsibilities of running two businesses, so he sold all of his interests in the cash register business to Jacob H. Eckert of Cincinnati, a china and glassware salesman, who formed the National Manufacturing Company. In 1884 Eckert sold the company to John H. Patterson, who renamed the company the National Cash Register Company and improved the cash register by adding a paper roll to record sales transactions, thereby creating the journal for internal bookkeeping purposes, and the receipt for external bookkeeping purposes. The original purpose of the receipt was enhanced fraud protection. The business owner could read the receipts to ensure that cashiers charged customers the correct amount for each transaction and did not embezzle the cash drawer. It also prevents a customer from defrauding the business by falsely claiming receipt of a lesser amount of change or a transaction that never happened in the first place. The first evidence of an actual cash register was used in Coalton, Ohio, at the old mining company. In 1906, while working at the National Cash Register company, inventor Charles F. Kettering designed a cash register with an electric motor. A leading designer, builder, manufacturer, seller and exporter of cash registers from the 1950s until the 1970s was London-based (and later Brighton-based) Gross Cash Registers Ltd., founded by brothers Sam and Henry Gross. 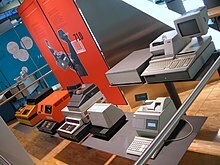 Their cash registers were particularly popular around the time of decimalisation in Britain in early 1971, Henry having designed one of the few known models of cash register which could switch currencies from £sd to £p so that retailers could easily change from one to the other on or after Decimal Day. Sweda also had decimal-ready registers where the retailer used a special key on Decimal Day for the conversion. In some jurisdictions the law also requires customers to collect the receipt and keep it at least for a short while after leaving the shop,again to check that the shop records sales, so that it cannot evade sales taxes.